Characterful collage to brighten your day. A children's illustrator by day, by night Kate Slater designs cards, wrapping paper, prints, brooches and other delights featuring her characterful paper cut and collage illustrations. 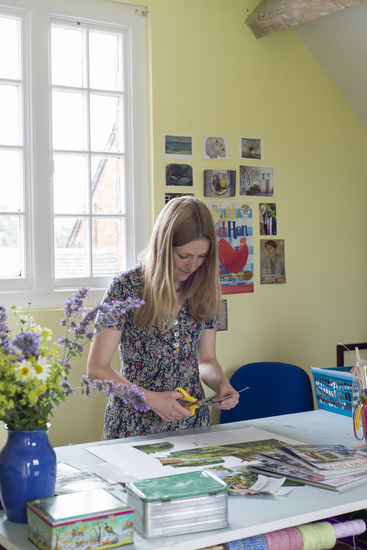 Kate's collages are mostly created using recylced paper from magazines, envelopes and other scraps, all made in her studio in a tiny village in the Staffordshire countryside. Kate offers a highly personal service and excellent quality, every product features one of her unique illustrations and is packed and posted directly to you by her own hands (or sometimes her mum's!). Kate is lucky enough to have illustrated several children's books, most recently The Birthday Crown, which was published by the Royal Collection Trust to celebrate the Queen's 90th Birthday. Please don't hesitate to get in touch if you have any queries and thank you very much for visiting! All work is © Kate Slater 2008 - 2012.